Does the M&I stock pitch template work for any industry? The most different industry is easily financial institutions (FIG), and commercial banks and insurance firms more specifically. Accounting is different, valuation is different, and you have to learn whole new methodologies. But the same structure for a stock pitch still works. I’m also sharing a complex 3-statement operating model and valuation for this same bank, with support for multiple scenarios. This model and stock pitch are part of our Bank & Financial Institution Modeling course, and are fairly recent additions (added in April this year). First created about a year ago (September 2015), this stock pitch proved to be 100% correct. And even before Brexit, you would have earned ~10% on this one. WARNING: This is a fairly advanced model. If you’re new to valuation, you’ll be completely lost, so stick with the explanation below for now. This model is also overkill for a short case study or modeling test. It took over a month to create, so it’s more representative of something you’d build on the job. We do offer shorter, simpler 3-statement modeling and valuation templates in the full Bank Modeling course. In the aftermath of the 2008-2009 financial crisis, big banks have suffered a lot. New regulations such as Basel III and CRD IV have made the banking business more expensive, and banks are now required to hold significantly more “capital” (i.e., common shareholders’ equity). It’s harder for banks to grow because they need more equity to support that growth; they also can’t grow their dividends as quickly for the same reason. In response, many large banks have dramatically cut costs and commoditized their products, such as loans to small-and-mid-size enterprises (SMEs) and mortgages. 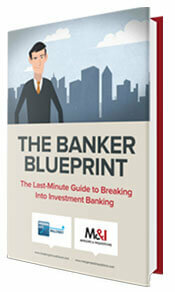 These changes created a market opportunity for new, smaller banks to come in and take away market share. In the U.K., “challenger banks” arose to serve these neglected market segments. There’s a great report from KPMG on this sector – at the time of this case study – right here. Challenger banks focused specifically on areas that require more customer service and customization, such as buy-to-let mortgages (i.e., mortgages for residences that the owners are renting out) and SME lending. 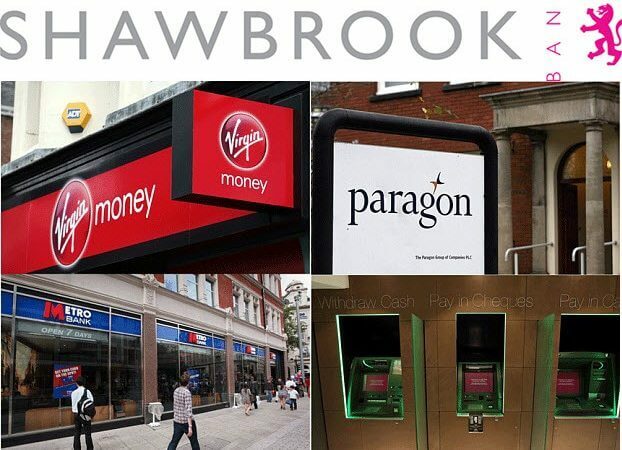 Shawbrook is one example of these challenger banks. At the time of this case study, it had grown its loan portfolio by 70% in its last fiscal year, far above its larger competitors (the “High Street” banks – Lloyds, Barclays, HSBC, and RBS). Other challenger banks, such as Aldermore and OneSavings, had also grown rapidly. But valuation is based on future growth, not historical results. So this stock pitch comes down to a simple question: Does this company’s expected future growth justify its valuation? The growth potential for a bank depends on 1) Overall economic or GDP growth; 2) The bank’s lending market share; and 3) The yields it earns on its loans. Bull Case: The U.K. economy continues to grow and avoids a recession, the company’s market share keeps increasing, and it maintains its loan yields despite increased competition. It begins to issue dividends and increases its payout ratio over time. Bear Case: The U.K. economy stagnates or goes into a recession, the company gains market share at a slower rate, and its loan yields decline. The company issues less in dividends and cannot increase its payout ratio as quickly. We have to decide which view, if any, is correct. Recommendation – Long or short, by how much is the company mispriced, and why is it mispriced? Company Background – The industry, operational metrics, and current valuation multiples. Investment Thesis – Explain the 3 main reasons why the company is not priced correctly, and why others haven’t noticed. Catalysts – Which specific events in the next 6-12 months will change the company’s share price? Valuation – The output of the public comps, precedent transactions, and DCF or DDM in different scenarios. Risk Factors – Why might you be wrong, and how could you hedge against this risk? Before writing the pitch, we created a 3-statement model and valuation for the bank to reflect the possible outcomes above. The most important parts of this model are the high-level operating scenarios and the dividend discount model (DDM). 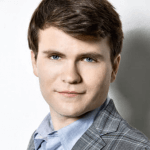 So you could simplify the rest of it by leaving out the detailed calculations for the comparable company analysis, the regression analysis, the residual income model, and other bells and whistles. For commercial banks, you should use scenarios because so many of the assumptions are interrelated. For example, if the country enters a recession, the central bank will almost certainly reduce interest rates. If GDP growth increases, the central bank might leave interest rates alone or start increasing them if things get too frothy. In the pharmaceutical industry, drug prices could move independently of expenses and other assumptions – just ask Martin Shkreli! LIBOR: All else being equal, higher rates tend to benefit banks. So we assume that prevailing interest rates increase to 1.55% over 5 years in the Upside Case, 1.35% in the Base Case, and 1.05% in the Downside Case. U. K. Nominal GDP Growth Rate: The Base Case has “steady growth” (2.0 – 2.5%), the Upside Case has faster growth (3.0 – 3.5%), and in the Downside Case there’s a recession followed by a recovery. Lending Market Share: The company’s market share of Commercial Mortgages in the U.K. increases to 0.80% in the Base Case, 1.00% in the Upside Case, and 0.70% in the Downside Case. Net Charge-Offs and Provisions: These trend closely with GDP growth since a recession will produce more defaults. So we assume a modest increase in the Base Case, a much smaller increase in the Upside Case, and a big increase followed by a decline in the Downside Case. Long-Term Return on Tangible Common Equity (ROTCE): This drops from 17% to 12% over 10 years in the Base Case, 14% to 11% in the Downside Case, and 20% to 14% in the Upside Case. Long-Term Asset Growth: The Base Case progresses from 12-13% down to 7% over 10 years, the Downside Case goes from 13-14% down to 6%, and the Upside Case goes from 14-15% down to 8%. We determined these numbers with various methods, including channel checks and peer banks. At this time, they both had ROTCE figures of 12-13%, which is a good indication that Shawbrook might end up there once it becomes larger and more mature. How Do You Build a Dividend Discount Model for a Bank That Does Not Yet Issue Dividends? 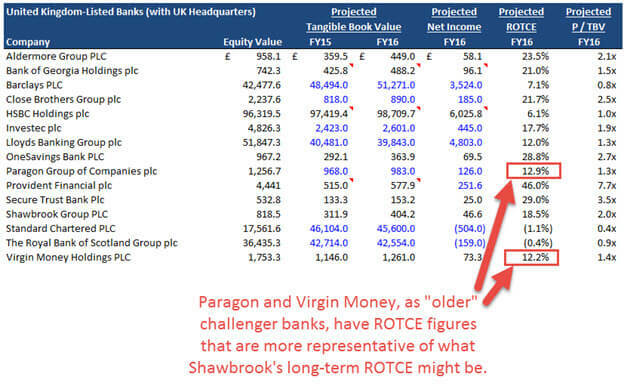 There were many challenges in creating this model and stock pitch, so here’s one quick example: It’s very difficult to calculate the Cost of Equity for a young bank like Shawbrook that went public only months ago. So we expanded the set of banks and calculated Cost of Equity for U.K.-based Large Banks and non-challenger banks. Those sets produce values in the 10-12% range, which seem more reasonable. And then we start the Cost of Equity at 12% in the first 5 years of the DDM and reduce it over time as the company grows and becomes less risky. The fact that Shawbrook wasn’t yet issuing dividends doesn’t make a difference – as long as the bank eventually starts issuing dividends, you can still use a DDM. Downside Case: Company is overvalued by ~50%. Base Case: Company is overvalued by ~30%. Upside Case: Company is undervalued by ~30%. So we might gain 50% by betting against the company, but if we’re wrong, we lose only 30%. It’s clearly a Short recommendation based on that logic. In our view, something between the Base and Downside Case is most likely. But Does It Make Sense in Real Life? Are There Catalysts? As with any stock pitch, you need catalysts for the recommendation to work. Stocks can stay mispriced for years if there’s no specific event within the next 6-12 months that causes the price to change. U.K. authorities are likely to increase the risk weightings on most of the company’s mortgages, which means the bank will need more capital. There may be a significant slowdown in loan growth due to an overheated real estate market, lower-than-expected economic growth, and changing stamp duties on buy-to-let properties. Spreads on loans may compress due to increased competition. Shawbrook already charges higher interest rates than many of its competitors, and we don’t think that situation will continue. Pollen Street Capital had a 45% stake in the company at this time, but the lock-up period on those shares was set to expire within the next year (on February 10th). If the fund sells some of its stake, it could trigger a wider sell-off of the stock. We acknowledge that we could be wrong in the Risk Factors section. With a SHORT recommendation, Risk Factors include anything that might increase the company’s share price – higher loan growth or dividends, more market share, higher spreads, and so on. It’s easiest to reverse the catalysts to come up with these. So one risk factor is that risk weightings on the company’s BTL mortgages might not change; another is that the commercial mortgage market may grow more quickly than expected; and another is that the company might maintain its spreads. These risks are all represented in the Upside Case, where the company appears to be undervalued by ~30%. We made the assumptions even more optimistic to examine a true worst-case scenario, and the company appeared to be undervalued by ~50%. We recommended hedging against these risks with call options and/or a buy-stop order. If the potential gain is 30-50%, we might purchase call options with an exercise price 20% above the company’s current share price to limit our losses to 20%. We could also long a competitor, such as Paragon, that’s more focused on BTL mortgages in case we’re wrong about the mortgage market. This recommendation turned out to be correct, but for an entirely different reason: Brexit. Even before that, valuations had decreased in the first half of the year, so this recommendation was still correct. But Brexit pushed it over the edge and made the actual change in the stock price very close to our predictions. When I wrote this pitch, I wasn’t even thinking of Brexit as a potential catalyst because a firm date for the referendum hadn’t been set. But the lesson is simple: Your recommendation could easily be right or wrong for completely different reasons. This tutorial, the stock pitch, and the Excel model give you more for free than most paid training programs or in-person training. If you want more, then the BIWS Bank Modeling course (short outline and long-form outline) is your best bet for comprehensive coverage of commercial banks. We began revamping it earlier this year, and plan to add a few shorter case studies on M&A and buyout deals over the next 5-6 months. But the most useful topics for interviews – accounting and valuation – are already there. The course covers this same Shawbrook case study but walks through every part of it step-by-step, sometimes in excruciating detail. I might have gone a bit overboard, but this is the finance industry. When in doubt, under-promise and over-deliver. Thanks for doing this, Brian. Without letting me take much of your time, how would you think about an operating model for a company like GM, whose balance sheet / CF are altered by the lending business auto makers do? You would probably create different projections for the lending business and assume loan growth proportional to auto sales growth to do that. We tend not to focus on companies like GM because they’re more difficult to understand and explain in interview settings, so they are not ideal for stock pitches and investment recommendations. Truly grateful for all these helpful articles. I have a question, does m&a modeling for asset management&wealth managemnet companies look similiar to banks and insurance companies? No. It’s much closer to what you do for normal companies, as is everything modeling-related for asset/wealth management companies. Brian, you are a great man! Thank you for all. I really believe that there works the rule of the of boomerang in our world, so I wish you good luch in all your endeavors. Oh you wonderful, wonderful human being. I’m currently working in Big Four transaction services in the FIG team where I’ve done a fair amount of work with these type of challenger banks from a TS perspective, but getting this sample stock pitch on not only FIG (which is hard enough to try and find as you can imagine) but on Shawbrook is incredible, thank you so much for this I really appreciate it. Thanks! Glad to hear it and hope you find this helpful. Aren’t you giving away too much? I was waiting for that comment… I don’t really think so. In the past, I gave away all the Excel files and PDFs in the Fundamentals course (https://www.mergersandinquisitions.com/biws-course-changes-dec-2014/). The thing is, these files are not that useful without the step-by-step tutorials and the ability to ask questions and get answers. And we only provide that as part of the paid courses. Someone who hasn’t signed up for the Bank Modeling course could get some ideas from looking at these files and the tutorial, but he/she wouldn’t be able to recreate this without completing the course.